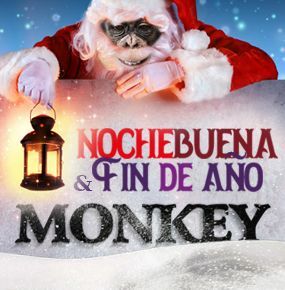 This year celebrate Christmas Eve and New Year’s Eve with Grupo Monkey, and choose between three very different culinary styles. Discover what’s on offer at each of our restaurants and make these magical nights even more special! For New Year’s Eve, we have prepared a special selection of off-menu dishes: at Monkey Bar & Grill, we will start off the celebrations with some sharing platters, followed by a choice of five starters and five main courses and an exquisite chocolate dessert. SEE OUR MENU. At Monkey Bravo! Italia this year, we’ve created a menu especially for this event, including an antipasto mixto to share, and a choice between four starters and four main courses. SEE OUR MENU. Let’s not forget the children! For the youngest members of the family we have created a menu they’ll love, with croquettes to start, followed by a choice of hamburger, mini-pizza or chicken tenders, topped off with a vanilla ice cream with Oreo biscuits. We also offer vegetarian options, just ask us for more details. What do you need to do when booking your New Year’s Eve dinner at one of our restaurants? In our restaurants where set menus are served, dinner service will be divided into two sittings. The first sitting commences at 7PM and ends at 9PM. The second sitting begins at 9:30PM. Due to the large numbers of bookings on these two special evenings, we can only guarantee tables or numbers once we have received payment of a €30 reservation deposit per person. This will be discounted from the final bill at the end of the meal. For more information and to pay your booking deposit, please visit booking.grupomonkey.com or alternatively you can call us on 608 595 491 where we will be more than happy to assist you.